Tomorrow is Thanksgiving Day..... And as has been increasingly the case in recent days (and months... even years....), I haven't had the time to post as much as I would like. This is especially disappointing to me as we approach my favorite holiday of the year—a day that is all about the Table. I love it that almost everyone cooks for this particular feast. And I love it that I get to participate—even if in just a small way—in the tables of many through the foods that I teach and recipes that I post. I console myself about the scarcity of recent posts with the thought that visitors can still find many delicious Thanksgiving recipes that I posted in previous years. To find them, check out the old October and November posts (click the links on the right), or visit the recently updated Thanksgiving appetizers, side dishes, desserts and all-things-pumpkin photo albums on my Facebook page. Today, I thought I would sneak in a dessert post. 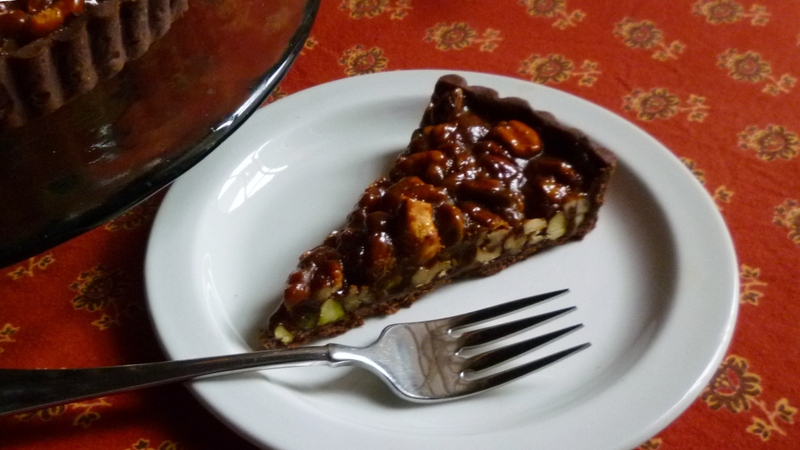 I have been making this Chocolate, Caramel & Nut Tart for a little over a year. It is rich...but not too sweet. A small sliver would be just the thing at the end of the big meal. It would satisfy the chocolate, caramel and/or nut lovers in the crowd...as well as those that really want pecan pie, but don't know if they can manage something so rich and sweet after a meal of Turkey with All the trimmings. 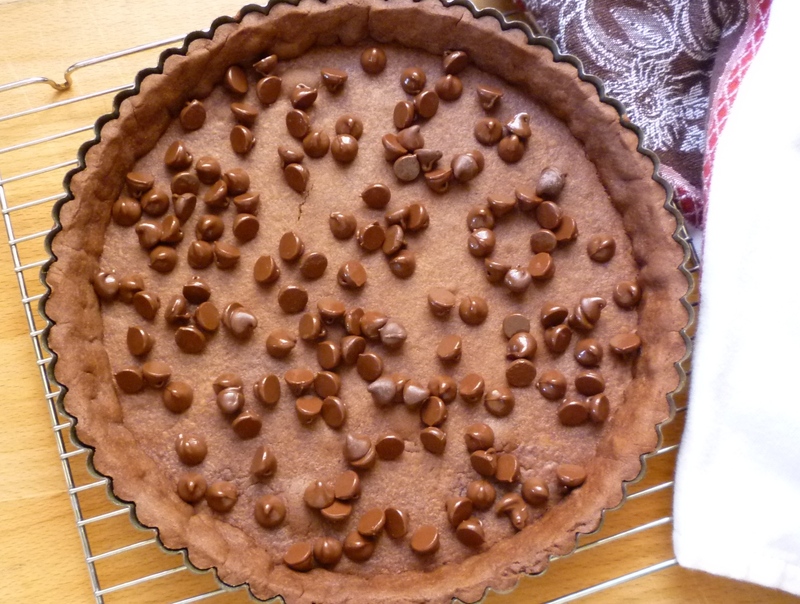 I have also discovered that unlike pumpkin pie, this tart keeps very well for several days at room temperature—providing a little something sweet for everyone to nibble on in between the flurry of holiday activities. 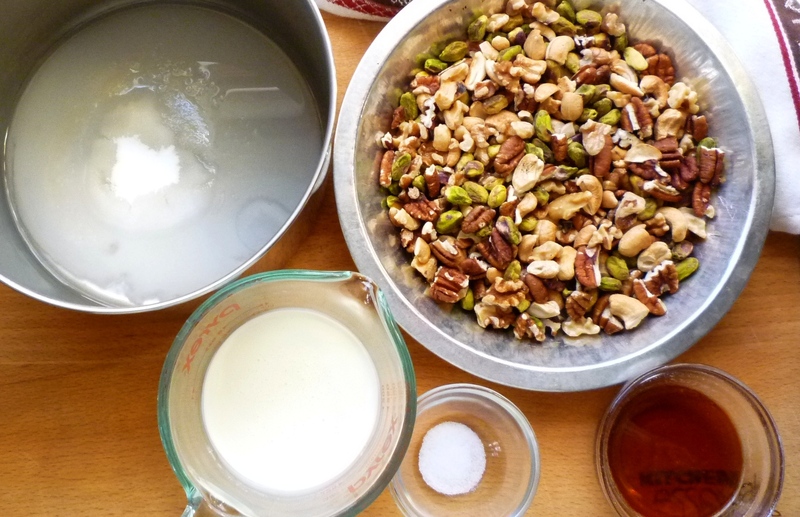 The tart is simple to make...and if you keep nuts and basic baking supplies on hand, you probably have everything you need to make it already. If you have crust phobia, there is no need to fear this crust. Like the plain sugar dough that I have posted several times, anyone who can make rolled sugar cookies, can make this chocolate crust. As for the caramel, just make sure you have all of the ingredients measured and ready and that you pay close attention as the sugar syrup cooks. There is no need for a candy thermometer, simply stop the cooking by adding the cream (stand back and use a long handled spoon) when the sugar syrup has turned a deep golden amber (you will even notice a small wisp or two of smoke when it is dark enough...but don't cook it much further than that or it will be bitter). The choice of nuts for this tart is up to you, but I find that walnuts, pecans and cashews (alone or in some kind of combination) make the best tart. These nuts all have a softer, more delicate crunch to them and have just the right texture when mixed with the medium soft caramel. 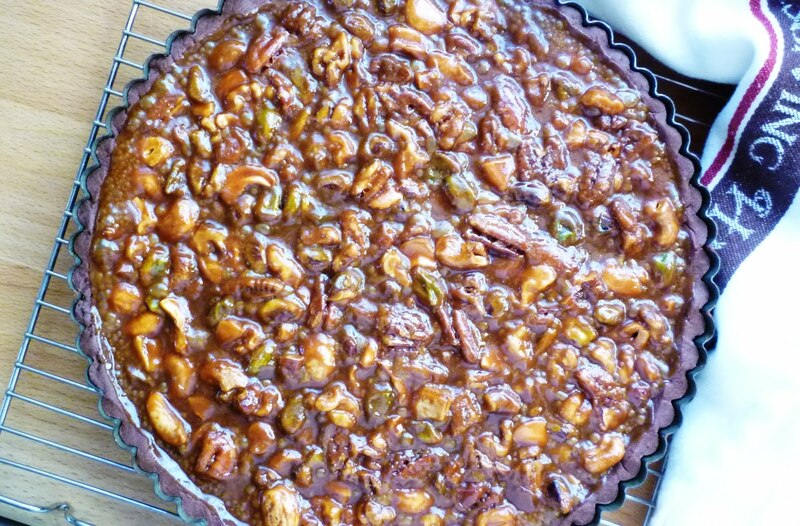 As much as I love almonds, they are simply too hard for this tart. They make the tart not only difficult to cut, but also difficult to eat. Pistachios (which I used in the tart pictured in the post) fall somewhere in the middle. Their texture is a bit more obtrusive than I would like, but most people would probably not be bothered by it...and they add nice flavor and color. Finally, I want to wish everyone the happiest of Thanksgivings. If you are cooking, I hope you find pleasure in the process. And I hope that wherever you are—surrounded by many or few...with family or friends—that you find yourself at a table where for a window of time the frenzied pace of life slows, and you revel in the gifts of the food, the fellowship, the conversation, and the moment. On a lightly floured surface, or between sheets of plastic wrap, roll about 3/4 of the chocolate dough out into an 11-inch round that is 3/16 inch thick. Transfer the dough to a buttered, 9-inch removable bottomed tart pan and ease the dough into the pan, being careful not to stretch it and pressing it against the sides of the tart pan. Use your hands to gently cut the dough flush with the upper rim of the tart pan. To blind bake, place the shell on a cookie sheet and bake in a 350° oven until set—10 to 15 minutes. (It is not necessary to fill this crust with pie weights.) 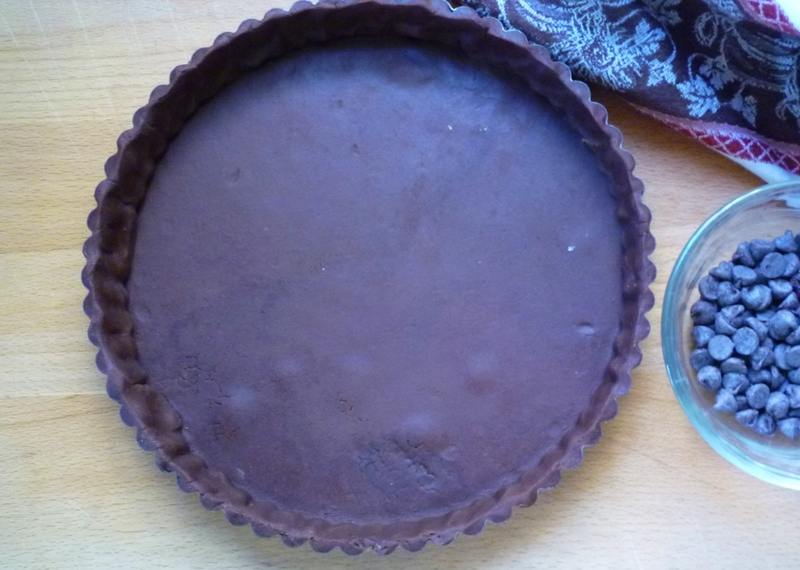 Remove the tart shell from the oven and immediately scatter the chocolate over the bottom of the shell. Let the chocolate sit for five minutes in the warm crust. When the chocolate is soft, spread it out into a thin layer that covers the entire bottom surface of the shell. Set aside. To prepare the filling, place the water in a large saucepan. Add the sugar and corn syrup and stir and cook over medium heat until the sugar has dissolved. Increase the heat to medium-high, stop stirring, and bring the syrup to a boil. Continue to cook, swirling the pan occasionally, until you have a deep amber caramel. Remove the pan from the heat and carefully and slowly pour in the cream (the mixture will hiss and bubble up, so stand back). 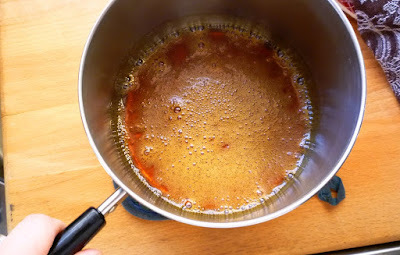 Return the pan to medium-low heat and whisk until the caramel is homogenous and any lumps have dissolved. Carefully stir in the honey, vanilla, salt and nuts. Using a slotted spoon, carefully transfer the nuts to the prepared shell, spreading them in an even layer. Slowly pour the hot caramel over and around the nuts, being careful not to let it overflow...you may have some caramel left over. Transfer the tart to the oven and bake until the caramel is bubbling all over...about 15 to 20 minutes. Let the tart cool at least 2 hours before serving (the tart is even better if made a day ahead). Slice with a sharp knife. The tart is delicious served with vanilla bean ice cream and chocolate sauce. Store the tart at room temperature. 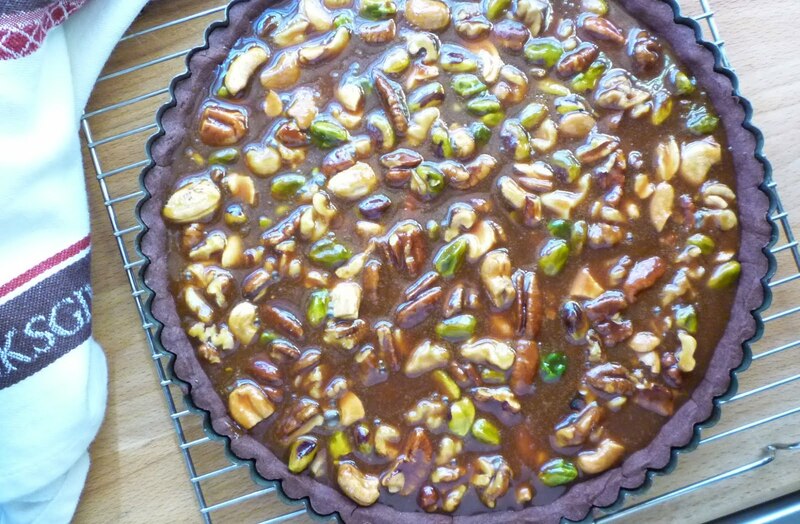 Note: You may use any combination of nuts that you prefer for this tart, although your tart will have a better finished texture if you avoid almonds. Almonds are quite hard and their texture is noticeable in the finished tart. My preferred choice is 2/3 cup each of walnuts, pecans and cashews. Toast each variety of nut separately (different kinds of nuts will take different lengths of time to toast) in a 350° oven, spread on a baking sheet, until golden and fragrant. In the bowl of an electric mixer fitted with the paddle attachment, cream the butter and confectioners’ sugar until just combined. Add the egg yolk and vanilla and beat until smooth. Sift in the flour and cocoa powder and beat on low speed until the dough comes together in clumps. Press into a disk. The dough may be used immediately or be chilled or frozen. This looks like such a special tart. Thank you very much for posting! How would it be with pecans, walnuts, and hazelnuts? Or do you think the hazelnuts would be too hard. You are right, almonds would be too snappy for this. I especially LOVE your photo on the light blue plate! It is lovely in every way. Hi Bonnie! I think the hazelnuts would be very much like the pistachios. I only used 1/2 cup of pistachios when I made the one in the pictures...and I noticed their different texture. More would have been bothersome. Perhaps if you break them up a bit? I didn't break the pistachios up at all because they were the same size as the pieces of walnuts and pecans already. I think breaking them would have helped some.